SunEdison stock's 52-week high was pegged at $33.45, it's 52-week low at $1.21. After receiving word last Thursday that a Delaware judge rejected a hedge fund manager's move for an injunction on SunEdison's acquisition of Vivint Solar, Inc. for $1.9 billion, SunEdison stock jumped 30% and closed at $2.26 on Friday. But as yesterday (Monday, February 29) unfolded there was troubling news for SunEdison causing whatever gains that were made on Friday to be lost and more. • ongoing inquiries and investigations by the Audit Committee of the Company’s Board of Directors (the “Audit Committee”) and its advisers described below, and the need to complete the inquiries and investigations prior to the finalization of the Company’s annual financial statements for the periods covered by the Form 10-K. The Audit Committee, advised by independent counsel and with the assistance of accounting and financial advisors, initiated an inquiry in late 2015 based on allegations made by former executives of the Company concerning the accuracy of the Company’s anticipated financial position previously disclosed to the Company’s Board of Directors (the “Board”). The Audit Committee, with input from the Board, has been working diligently with its advisers since late 2015 and as of the date of this filing has found no wrongdoing based on the former executives’ allegations, although this process is still underway. . .
SHORT HILLS, N.J.--(BUSINESS WIRE)--Appaloosa LP today disclosed that it has decided to accept the invitation of the Delaware Chancery Court to pursue an expedited trial against SunEdison. On Thursday, February 25, 2016, Delaware Chancellor Bouchard indicated that he “will…grant expedited proceedings for the purpose of holding an expedited trial” and indicated that the closing of the pending merger with Vivint will not prevent Appaloosa from obtaining relief to protect TERP and its stockholders from the injurious effects of the take/pay arrangement between TERP and SunEdison that Appaloosa has challenged. The Court expressly warned litigants not to “underestimat[e] this Court’s power to grant relief in the future if it is warranted” (Tr. 32) and specifically explained that “Goldman [Sachs]…should consider itself on notice of the possibility of relief being granted in [Appaloosa’s] favor at a future date, if it is warranted, after a full record has been developed [at trial]”. (Tr. 33) In connection with the upcoming trial, the Court offered “some guidance for the future course of this case” (Tr. 36), saying that the process used by SunEdison to approve the transaction appeared “inherently suspect” and that it entertained “serious doubts” about that process. (Tr. 36-37). In addition, “troubling” circumstances surrounding one of the Conflicts Committee’s advisors “raise serious questions that go to the fairness of the process.” (Tr. 38). In light of the Court’s guidance, Appaloosa believes that an expedited trial is in the best interests of TERP and its stockholders. TerraForm Power, Inc. (TERP) is a yieldco whose parent company is SunEdison. 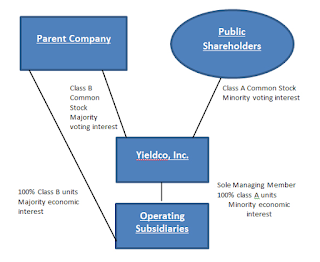 The parent company must own a majority share of the yieldco (Class B Common Stock), while public shareholders are entitled to a minority share (Class A Common Stock). 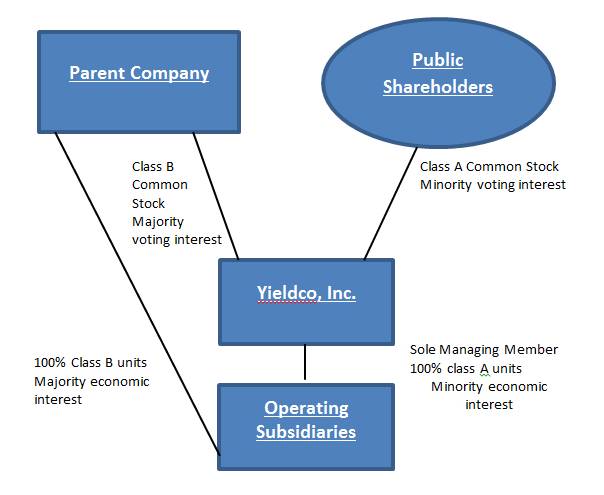 Typically, a yieldco bundles renewable and/or conventional long-term contracted operating assets to generate a predictable cashflow where cash distributions to its shareholders are paid out as quarterly or annual dividends. As the corporate home to more than half of the U.S.’s publicly traded companies and 63 percent of Fortune 500 firms, Delaware had more than 1 million legal entities incorporated in the 900,000-resident state as of 2012. The chancery court has become the prime forum for resolving those companies’ corporate disputes. Chancery court decisions go directly to the state Supreme Court for review. Since it offers only non-jury trials, the court can provide quicker hearings than regular courts, sometimes having cases heard and decided in a matter of weeks or months rather than years. Even though SunEdison is making a serious effort to restructure and liquidate its financial situation is tenuous. Still want to bash HECO over its decision to cancel the SunEdison power purchase agreements?